The Portiuncula Chapel, on the grounds of Cardinal Cushing Centers, Hanover, Massachusetts, is the final resting place of Cardinal Richard Cushing. It was his desire to be laid to rest close to his beloved exceptional children. The word Portiuncula means “little portion” in Italian. 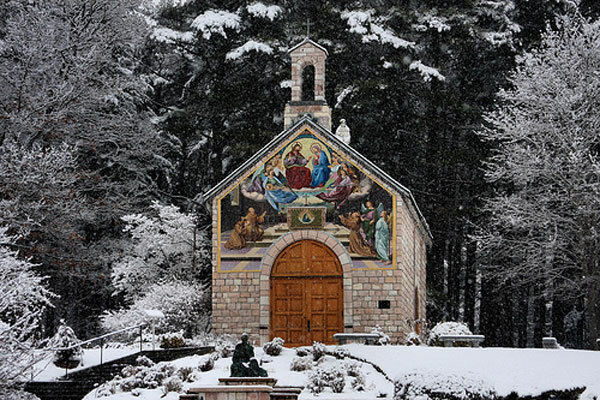 When constructed on the Hanover campus in 1953, Cardinal Cushing made a point of making sure that every stone, every fresco, and every part of his Chapel came from Assisi—where, over 700 years ago, St. Francis himself built the chapel that inspired it. It was Cardinal Richard Cushing who initiated construction of the Portiuncula Chapel on the scenic Hanover Campus. He looked for a stone mason trained in the Italian marble tradition and authentic material, and found a remarkable craftsman named Frank Tarzia of Hingham. Appropriately enough, Tarzia’s search for the proper materials took him to the quarries of Assisi, Italy where he labored to insure that every stone matched its counterpart in the original chapel. When the precious cargo arrived in Boston Harbor, the Cardinal was there to bless it. “His Eminence visited two or three times a week to check on my progress,” Frank Tarzia recalls. Tarzia often worked late at night when, undisturbed, he could concentrate on each detail. The sisters frequently climbed the hill to encourage him after the children were in bed. They brought flowers to the place where the altar would be. Sisters and children came to watch and cheer Mr. Tarzia on when a crane lifted the statue of St. Francis to its place on the roof. “I built it so firm and strong it will never come down until the end of the world,” Frank Tarzia said with justifiable pride. A special place to visit. The Portiuncula Chapel is open 7 a.m. to 5 p.m. on weekdays and 9 a.m. to 5 p.m. on weekends, unless the walkways are icy. month May thru October, 2019. Download flyer for full details here. Buy an Enrollment Card. Create a memorial. Create a lasting tribute to someone you love by having purchasing an Enrollment Card to help support the chapel. Order Enrollment Cards by calling 781-826-6371.